"Start the day with a sweet and creamy smoothie or blend up a snack for the kids in the afternoon. Frozen raspberries or banana will work for this, but you may need to reduce the ice. Everybody has their own preference for the texture and consistency of a smoothie, myself included." Blend ice cubes, raspberries, orange juice, banana, yogurt, and honey in a blender until smooth. I skipped the ice and used frozen raspberries and a frozen banana. I also used vanilla greek yogurt. One of the best smoothies I have ever had--my kids absolutely second this. 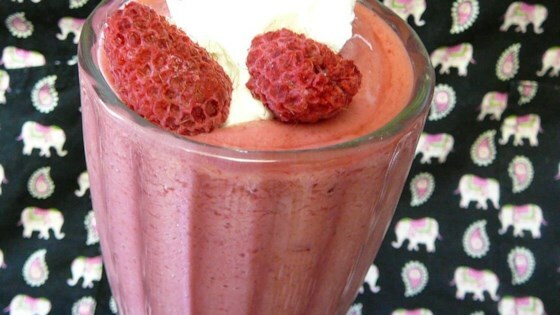 If you like raspberries, this smoothie delivers great flavour. I left out the honey and used frozen fruit and didn't need ice cubes… I could have this every day. Excellent! Awesome! Very raspberry-y. I left out the honey because I like the tartness. Very cold so good for a hot summer day. Tasty and smooth drink.